Optional Intelligent All-Wheel Drive helps give the Lincoln MKX enhanced traction while providing impressive performance along with tighter handling and control. This system responds actively by redirecting power to the appropriate wheel for best traction. It also helps enhance the vehicles performance and handling in driving conditions such as rain, sleet, snow, gravel or sand. Providing an exhilarating and sporty drive, the six-speed SelectShift® automatic transmission with steering wheel-mounted paddle shifters offers the excitement of a stick shift with the convenience of an automatic by allowing the driver to manually select gears. The Lincoln MKX also offers hill start assist, which makes pulling away easier when the vehicle is on an uphill slope. This technology can help prevent rolling back on a grade by maintaining brake pressure for approximately two seconds while the driver moves his/her foot from the brake to the accelerator. Tow up to 3,500 lbs. when your Lincoln MKX is properly equipped with the available Class II Trailer Tow Package, which includes trailer sway control to help you maintain control. That’s serious capability for a modern crossover. It works in conjunction with AdvanceTrac® with RSC® (Roll Stability Control™) to help maintain vehicle and trailer stability while you’re towing a trailer. Trailer sway control applies brake force to individual wheels and, if necessary, reduces engine power to help the driver regain control. The 2015 Lincoln MKX offers an exhilarating 3.7L Ti-VCT V6 engine with impressive standard 305 horsepower and 280 lb.-ft. of torque. Simply amazing. 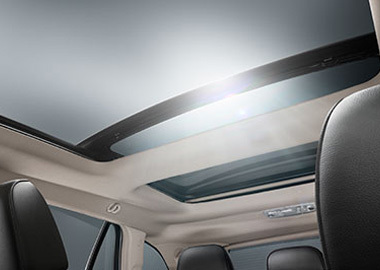 The available panoramic Vista Roof® spans both rows, allowing for abundant sunshine and cool breezes. The front roof panel is powered for easy opening and closing, and includes a power sunshade to help keep the interior cooler on warmer days. Elevate your journey and take in the scenery. 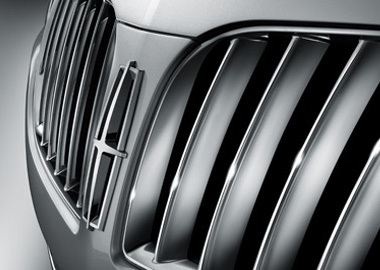 The boldly distinctive split-wing grille showcases the modern design of the Lincoln MKX. A dramatic look in modern chrome. Relax on your drive. Leather-trimmed, heated and cooled front seats were designed to cradle and comfort. The 2015 Lincoln MKX offers excellent seat comfort with 10-way power that includes power lumbar support and driver memory settings for two drivers. The available Navigation System with a 72-month subscription to SiriusXM® Traffic and SiriusXM® Travel Link. It combines Global Positioning System (GPS) technology with 3-D mapping and provides voice-guided turn-by-turn directions. SiriusXM® Travel Link offers traffic alerts, weather, fuel prices, movie listings and sports scores. Includes THX® II Certified Audio System. Best of all, enjoy the crystal clear sound of HD Radio™ Technology. Create a warm and inviting interior when you upgrade to the available genuine wood trim in walnut swirl or olive ash. The unique wood trim embellishes the instrument panel appliqué, interior door-trim panels and steering wheel inlay. Create an individualized, calming atmosphere with available ambient lighting in seven unique colors. Light emits from the front-console cupholders, door release handles, front and rear footwells, and front door storage pockets. Choose the color that matches your mood. The MyKey® feature lets you program a restricted driving mode on one of the keys supplied with the vehicle. Limit top speed to 80 miles per hour and speed minder will chime when the driver exceeds a preselected speed of 45, 55 or 65 mph. MyKey can also limit stereo volume to 45 percent of maximum output. Additionally, the Belt-Minder® alert cannot be disabled, and when front safety belts are not buckled, the audio system is muted. One less thing to have to think about. When it starts to rain or snow, the available rain-sensing wipers automatically activate and can be set to one of five levels of sensitivity. So intelligent, you’ll wonder how you ever got along without them. The five moisture-sensitivity settings accommodate light rain or a downpour. The available rear view camera is activated when the Lincoln MKX is shifted into Reverse, and displays items behind the vehicle on your eight-inch touch screen. Colored guides shown on the touch screen help you judge how far behind objects are. The feature works in conjunction with the Reverse Sensing System by alerting you with tones as you slowly back up.